Soil Fertility is often the most limiting factor to economic crop yields. In years past, soil fertility involved testing N, P, K, pH, and a few crop-specific micronutrients; then recommending a rate of fertilizer application that considers soil type, crop removal, timing, method, and other factors. Soil Fertility is a term that should be used as a general state of the soil. Though always known by farmers and agronomists, a term now becoming more popular is ‘soil health’. This is an all-encompassing term which considers the biological status of the soil in addition to the metric of measuring the 17 essential nutrients required for plant growth. It has a long term focus. Things like maintaining organic matter and adding more as it is depleted; using reduced tillage so as to not damage soil structure; crop rotation so as to cycle biomass back into the soil; and other steps all contribute to soil ‘health’. In heavily weathered soils, even when farmers do all these things, the crop yields do not increase or even may decrease because the available nutrients provided by a strictly organic system are not adequate for the crop being grown. Do fertilizers harm the soil? This is a common statement and on its own, is false. In fact, fertilizers will assist with the conversion of inorganic Nitrogen locked up in the soil organic matter because the bacteria that are responsible for the final phase of mineralization are Nitrogen ‘hungry’. A little nitrogen at the right time can assist with this conversion, and increase economic yields significantly. All fertilizer materials lend themselves to a range of application methods, including broadcast application, banding, injection, and application with a sprayer. Choice of method and placement is related to the nutrient, and timing of need for the plant. Broadcast applications spread the fertilizer across a wide pattern. Phosphorus, Potassium, and other nutrients are fairly stable once applied to the soil surface and are not subjected to the atmospheric losses that Nitrogen is vulnerable to. Stable forms of Nitrogen include Ammonium Nitrate and Ammonium Sulfate. Ammonium Nitrate is not easy to handle as it has a very low melting point and will literally melt when exposed to heat and/or sunlight. Ammonium Sulfate is the more desireable form of stable nitrogen, but is typically more expensive. Urea, a cheaper form of nitrogen, undergoes rapid chemical degradation when applied to soil, and if not incorporated by rainfall or tillage fairly soon (as little as 12 hrs) you can lose up to half of its actual N from volatilization. UAN solution (a liquid blend of Urea and Ammonium Nitrate) is a fairly stable form of ammonium nitrate, but the urea component can kick off its ammonia fraction as described above. There are stabilizing compounds for Urea and urea-containing fertilizers, but they are not consistent in their ability to stabilize the ammonia fraction, and often times are not worth the extra cost. is the application of a low concentration of fertilizer diluted with water, and sprayed on the leaves of the plant. It is usually a short term solution, or used in high value crops in a greenhouse. Foliar feeding can correct symptoms of micronutrient shortages but only the symptoms. For example, an acid loving plant grown in a soil that is too high in pH will exhibit ‘iron chlorosis’. If you treat it with a foliar feed application of ammonium sulfate with iron chelate, it will absorb the minute amount of iron in the solution that makes the plant ‘perk up’, which might make it healthy in the short run, but if you don’t also treat the soil, the plant will revert back to that state without further treatments. Always follow label directions with a foliar feeding system. Limitations: potential for scorching the plant, limited to small and repeated application, expensive. Fertilizer can be applied in a band near where developing roots will easily reach it; either to the side and below the seed rows, slightly below the seeds, or in between rows. A common practice is to band fertilizer 2 inches to the side and 2 inches deeper than the seeds or plants. This provides the plants with a concentrated zone of nutrients and can improve nutrient use efficiency. ; without being so close to the seed as to cause salt burn. The process can be done before or simultaneous with planting or seed drilling. Liquid or dry fertilizers can be used. Advantages: high nutrient use efficiency, jump-starts early growth. Many fields are deficient in P, due to soil binding and cold temperatures. Banding P makes it easier for plants to grow. This involves applying fertilizers (usually N) when the plant needs it most. You can significantly reduce total N requirement over broadcasting pre-plant because the N is not lost between planting time and the period of rapid growth when it needs it most. Disadvantages: another pass through the field and associated costs in fuel, labor, etc. How do I achieve my greatest return on the fertilizer I purchase? 1.) Strive to maintain soil health…all the things mentioned above…good rotation of crops, use cover crops, minimize tillage, maintain surface residue to cool the soil and prevent the rapid breakdown and loss of organic nutrients, etc. 2.) Test your soils .. know the health of your soil by testing it. Test it over time to see what nutrients are becoming deficient and respond with best management practices to correct them. 3.) Use the proper fertilizers and time their application according to when the plant needs them. This is the single largest way to minimize how much you have to spend on purchased fertilizers. Nitrogen is the most responsive to timing because it is the most sensitive to environmental loss from leaching, volatilization, and denitrification in waterlogged soils. 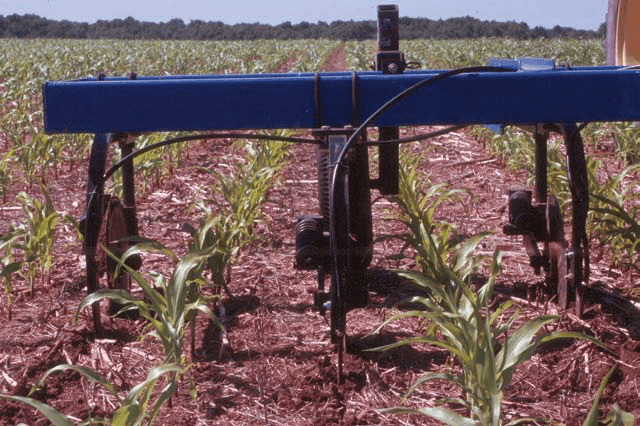 When Nitrogen is applied at the right time for the plant’s needs, you can use as much as 50% less than you would have to apply if you did it all at planting, for the same yield. Photo: Sidedressing a crop while cultivating has many benefits. You can use a fraction of the nitrogen you would have to apply if doing so all at planting; you aereate the soil, which assists the soil to ‘breathe’ and provide soil moisture from the soil below the root zone; and most importantly, you are feeding the crop when it most needs it. 4.) 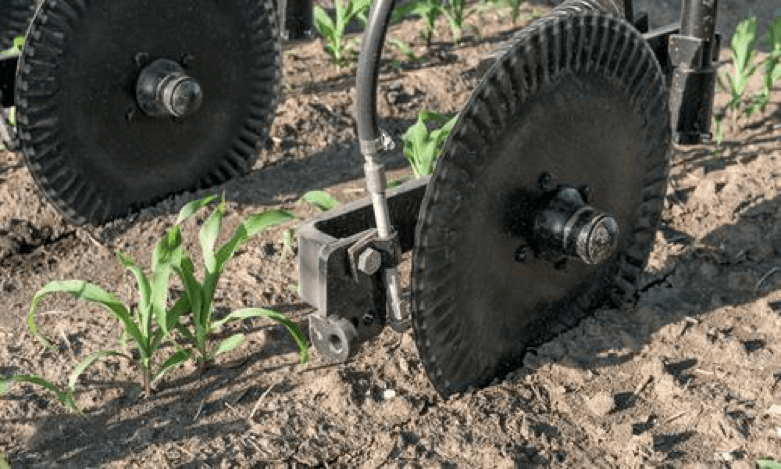 Control placement of fertilizers – when planting the crop, by applying your basic starter fertilizer in a band, or in closer proximity to the germinating seed, you will receive the same response as if you broadcast it in many cases; particularly Phosphorus and starter Nitrogen. Broadcasting Phosphorus at 4X the rate you would band it at still might not give the response that banding it near the seed will. Most annual crops that require a lot of nitrogen only need a small amount of nitrogen to get started in a healthy manner. The balance can be put on after the plant is actively growing. Photo: Banding of fertilizer makes your fertilizer investment count. You can use a fraction of the amount of fertilizer, place it where it needs to be, and your crop will get a much healthier start.